Encompassing a number of the trends in 2014, the above image includes turquoise, light wood tones, floral influence, outdoor furniture inside and a little hair on hide. 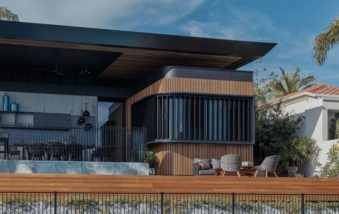 You’ll be wondering whether you’re indoor’s or out with this trend, where we’ll see more designers and manufacturers creating outdoor designs for inside the house. Not only that, we’ll see bespoke designs using extravagant ideas which’ll literally cause a ‘wow’ reaction to guests. Again, a trend which I’ve seen at November’s Grand Designs Live show which I hadn’t seen as much in previous years. You’ll be so confused at the end of the year, you’ll be lugging in a few of those deck chairs in your garden and arranging them in your living room. An extravagant example of bringing the outdoors within. 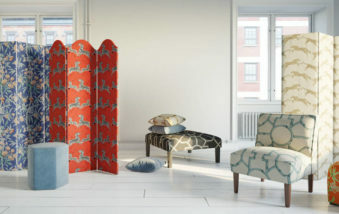 Ethnic fabrics, upholstery and prints look like they will be a popular trend this year. Adding a fresh pizazz to your home from far off exotic lands can break up boring bland interiors and if authentic, can be fantastic conversational pieces. So if you see a cushion, print or covering which is oozing with culture this year; don’t shy away. Ethnic designs on pillows bringing the couch to life. Beige is one of those color palettes which has been a favourite for years. It is a safe color, it’s timeless and it works well as a base color for exciting plashes of color accents. It doesn’t have the edge it once has and its popularity has been waning over the past few years. I as well as countless other designers share the sentiment that the popularity of beige will continue in its demise. It’s one of those which will stay around in some form of strength but it’s lost its lustre. This year we will see a continuation of the unwinding of a strong but sterile trend. Beige: Works but waning in pizazz. Brass has the ability to look ludicrously luscious or tantalizingly tacky. A number of years back I was taken around a designers showroom in China who specialised in brass-ware; it looked tacky and clichéd. It’s important to inspect designs which are executed poorly, to determine what mistakes to avoid. 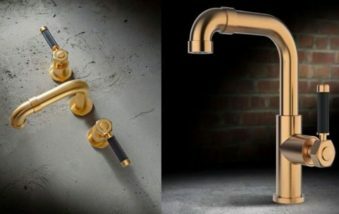 When done right, brass looks classy, it’s timeless, it’s also a trend which has been gathering steam over the past year. In 2014 we foresee a rise in the popularity of brass, particularly in the kitchen, bold brass bathtubs (as per the image below), lamp stands and other ornamental pieces. Don’ think trousers (pants), think settee’s (couch)! Many designers are bringing corduroy into their focus this year, utilizing this velvet alternative to great effect. We are seeing bold statements in upholstery, wide audacious bands of cord. A growing trend which will definitely gain momentum in 2014 and 2015. Let’s get this train moving; and who knows, in time it could become a speeding locomotive. Adventurous wide bands on the corduroy couch. Inexpensive and accessible to most, as long as you can find a supplier, fiber-art and macramé is arty, creative and takes the edge off of plain walls and rooms. It’s definitely a micro trend at the moment, but should continue to snowball over the next couple of years. It can be used instead of fine art, expensive wall paper and other more expensive wall pieces, and it’s for these reasons why I and many other designers believe this will be a successful, growing trend in 2014. Red macramé chair adding a striking edge to the room. Floral designs and chint textiles, as per the picture below, is a growing trend, not only in the interior design world, but also in other markets such as fashion. When there is a lap over of a particular trend in more than one vertical market, in this case floral, the trend has a tendency to have staying power; the perfect storm one might say. This will be a strong trend in 2014 that you’ll see popping up everywhere, from billboards, shop windows, interior designs and commercials. Floral textiles are a great option for any new designs. This is all about creating mood. Huge expanses of plain white, lifeless walls will be replaced with interest, mood and character. Think daring and valorous, making a statement with every element of the design. Interesting and metallic accessories will be the perfect accompaniment; supplementing, complimenting and adding to the glam. A weaker trend for 2014, but still growing at an increasing rate. Glamorous and bold, making use of blues, interesting accessories and metallic lamp stand. No longer is hide doomed to reside on the floor. Now in 2014, we’ll see this hair on high. Off the floor and promoted onto couches, settee’s, consoles, tables and cushions. We’ve seen a lot more of hair on hide in the Grand Designs Live exhibition, which has caused our mental faculties to be alerted to this trend across the internet. Natural is best, but also comes with a level of controversy. There are big voices out there who cry out against using animal skin, however there are now humane ways of obtaining the hides, hides which would have been otherwise wasted (sadly enough). Controversial but growing: Hair on hide chairs adding flavour to the room. In 2014 there’ll be a move towards versatility. Instead of having one set look, we’ll see a base hues enlivened with accents of color which’ll bring a monotonous box into a fresh lively room. We’re talking bright chromatic splashes over unsaturated undertones. It’s a fresh and lively trend which invigorates the senses and perks up the spirit. Vibrant colors complimenting soft undertones. Light, fresh looking, honey toned woods look to be in this year. 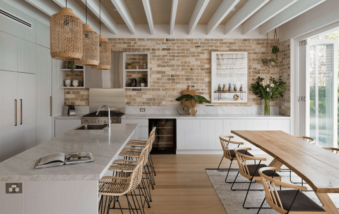 The overzealous use of rich, deep toned woods which has been popular in design over the past 5 years could be the catalyst for this honey-fresh movement. Oak and cherry are both fantastic options here; both in design, durability and aesthetic appeal. Go for high quality, don’t be stingy with the cost as it’ll be an elegant and exquisite show piece for generations to come. This trend has been growing steadily over the past 5 years and is continuing to take ground. Blue is without a doubt a massive trend this year. We at Freshome are seeing it everywhere, from home design exhibitions to the catwalk. It’s all about blue, and don’t be shy about sticking to one shade either. Different shades of blue rolling back into each other in the same room will ignite the senses. Azure, beryl, teal, cobalt, sapphire; a cerulean of blue, folding back into themselves in an ocean of electric design. 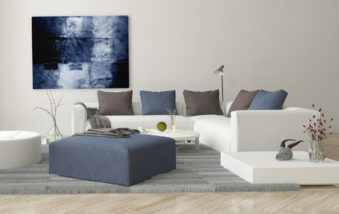 Apart from turquoise which I cover in a later point, the other shade of blue which has gained popular traction is navy. A calming, shade which commands authority without appearing desperate; easy and pleasant on the eye, this is one you can’t go wrong with in 2014: Navy is vogue. Use it in accessories, soft furnishings, couches, cushions, cupboards, walls and anywhere else you can imagine it. We’re seeing it everywhere, We’re seeing it in the design sphere: Blue will be big in 2014. Blues being effectively implemented in kitchen setting. 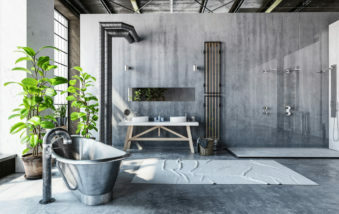 It’s been a staple in interior design over the years, but now we’re seeing a shift to softer tones of black and white, taking that harsh edge off of the contrast. The softer tones are easier on the eye, they’re comfy and relaxing, yet they don’t take the edge off the swank. This is a trend which has been evolving over the past couple of years and evidence from the design hemisphere shows a continuation in strength over 2014. An almost timeless trend that will look good for a long time to come. Parisian soft black & white: Very cosy! This is one of those very specific trend predictions that is far from vague and generalized. Pineapples; we are seeing them on the cat walks, design, prints and home design exhibitions. Whatever it is about this delicious delectable treat; it’s made it onto our tables in a different form which certainly isn’t edible. Keep your peepers open in 2014 for this one. A trend which will be restricted in its scope, but a feisty one nonetheless. Take a look at the adorable pineapple candle holders on the kitchen counter below. Pineapple accessories on kitchen counter. Modern yet reminiscent of timeless designs; people are flocking back to those immortal traditional designs and have been for a few years. When done right, it is safe and will stand the test of time. In an economy where keeping up with the Jones’s may not be financially feasible, going with something that is never going to drift out of fashion is a secure strategy. Beautiful ceiling, timeless couches which face each other while using modern L.E.D. light technology to add the edge. Here we are again; but this time a specific shade of blue. Turquoise screams of life and personality and there is a plash of this color everywhere we look now. The difference in feeling this vibrant tone gives a room is in such stark contrast to a mellow navy. In my opinion it’s trickier to use right than navy, but as with everything, when it’s tricky, if done right it usually looks eye catching with the razzle-dazzle edge. It’s one of those ‘in your face’ nimble colors that is hard to miss, and now it’s on your mental radar, you’ll notice it appearing more and more throughout 2014. A trend which grew leaps and bounds in 2013, with a strong foundation to leap up from and press forwards with great vigor and potency in 2014. Interior Institutions, Inc. Frolicsome and spirited, this fresh breeze of turquoise truly animates the bathroom. One of a kind or difficult to find pieces will be popular in 2014. Adding something different, unique and special to your designs is an easy way to put a unique personal accent on a design, which is a refreshing way to separate one from another designer. Find unique one of a kind pieces. Transparent, fresh, bright, light; these are words that are on the lips of designers in 2014. An easy way to create mood while not sacrificing privacy or light are window sheers. Woolen and linen are the materials of choice for wondrous window sheers in 2014. Window sheers: Bright, light and fresh. 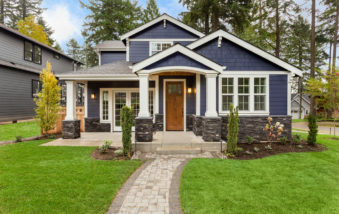 What Classifies A House Style: What Makes A National Home?